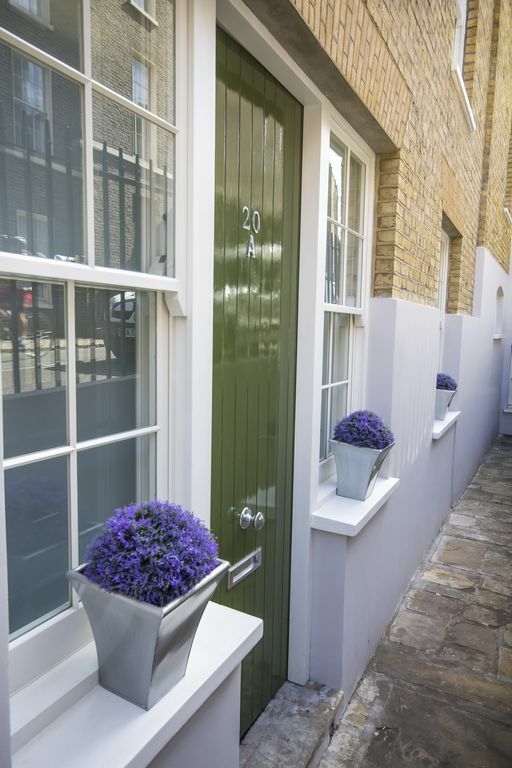 This three story Mews house in Bloomsbury is the ideal holiday rental in London for families, groups, romantic getaways or for business travellers. 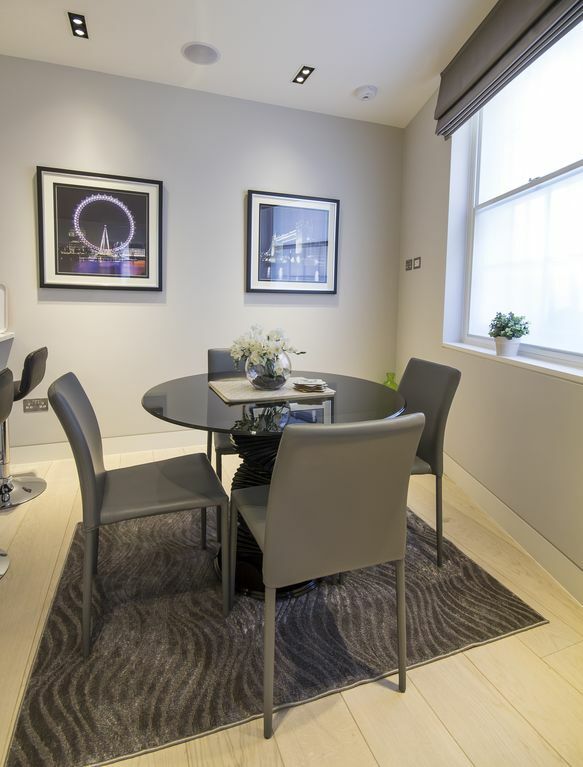 The property is ideally placed for you to explore the whole of London, with world famous areas such as Covent Garden and the City of London as well as museums in London such as the British Museum a short walk away. Decorated and finished to the highest standard, the house offers air conditioning throughout as well as little luxuries such as a great coffee maker, built in sound system and cable TV. Upon entering, we are sure you will fall in love with the overall sense of space and light, with the open staircase funneling light throughout the property. 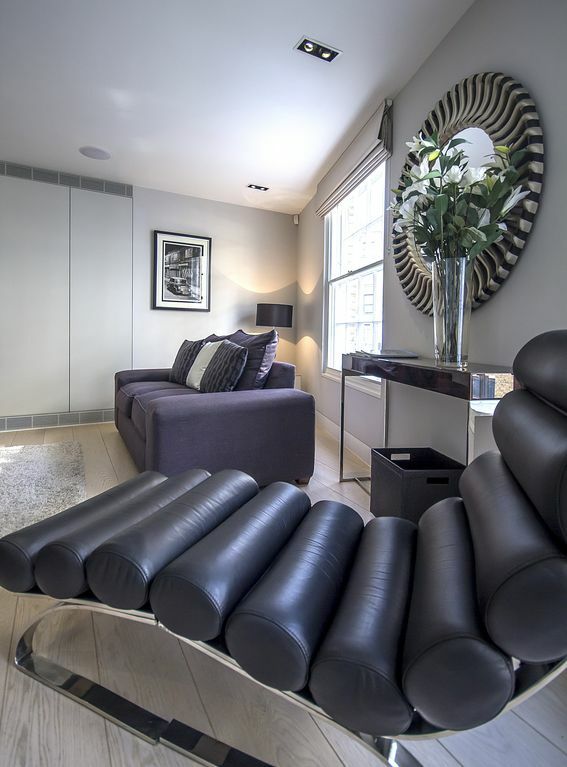 Arranged over three floors, this property is light, spacious and full of little luxuries. 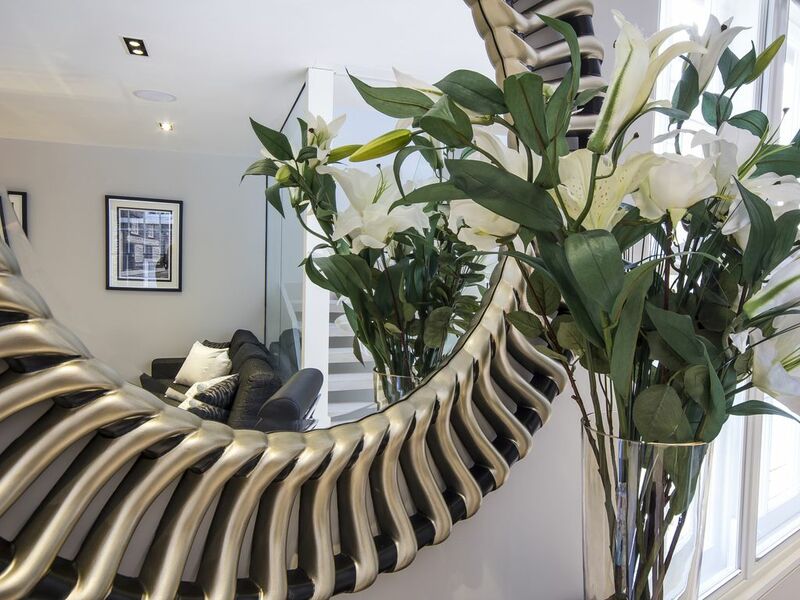 Taking the well lit, glass staircase to the second level, you come to the open plan living and dining areas. Turning left, the seating area is tastefully furnished with two large sofas (one a sofa bed sleeping two people) and a reclined chair. The focus of this space is relaxation and entertainment. 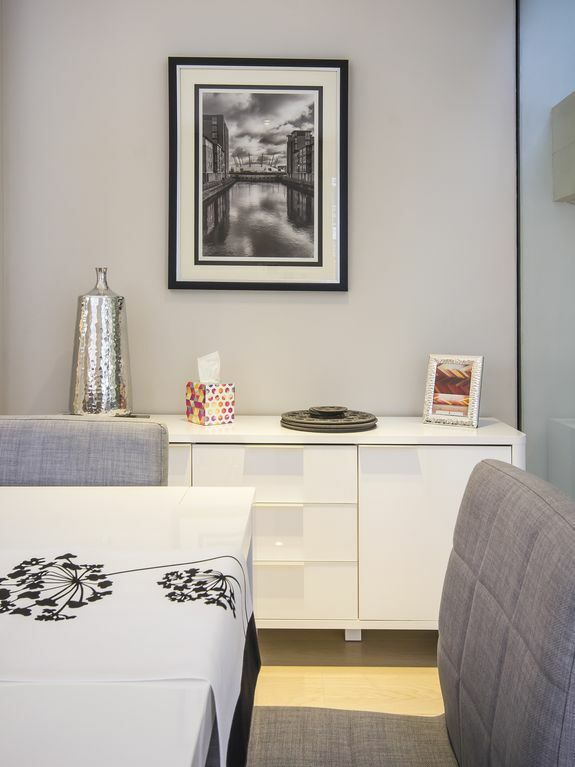 The 50 inch TV with cable TV as well as WIFI, a selection of magazines and a music system mean whatever mood you are in, there will be something to keep you entertained when you want a quiet, relaxing evening in. To the other side of the first floor space is the formal dining area. 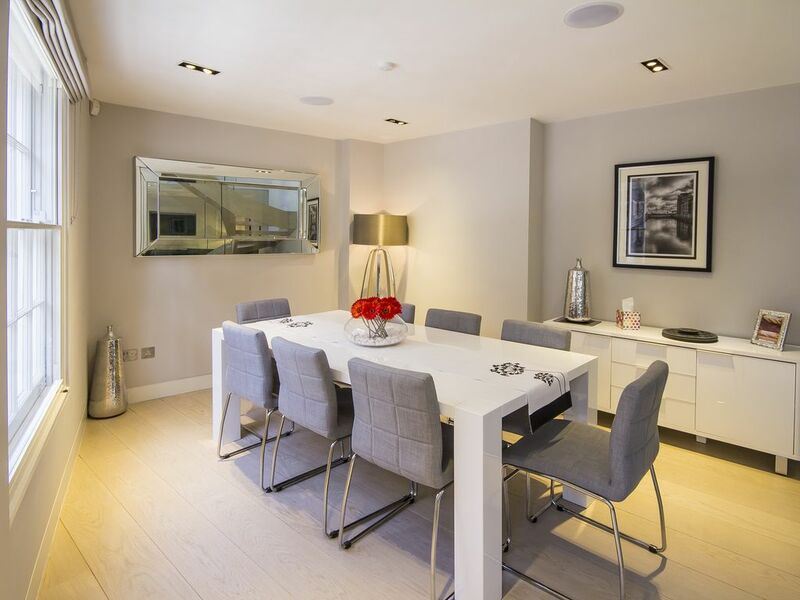 Seating 8, this space includes a modern, elegant dining set as well as glass and tableware for you to entertain your family, group or any guests. 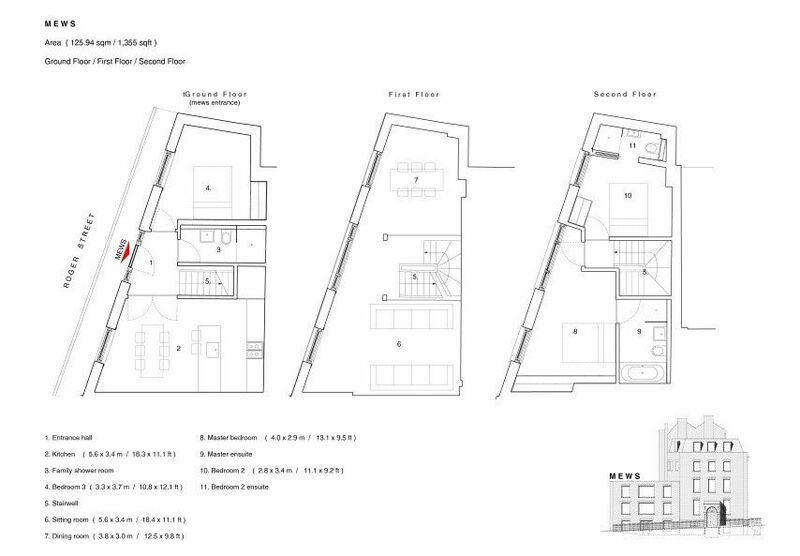 Both areas are illuminated by two large windows which feed into the open, welcoming feel the space has. 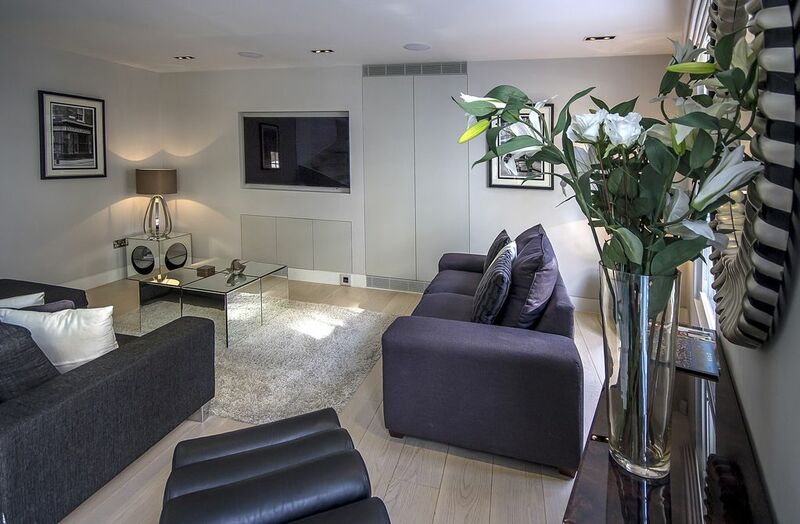 Downstairs, upon entering this stunning mews holiday rental property you will find a fully fitted kitchen to your right and bedroom to your left. The kitchen is fitted out with all the latest equipment, please see these listed in the facilities information below. 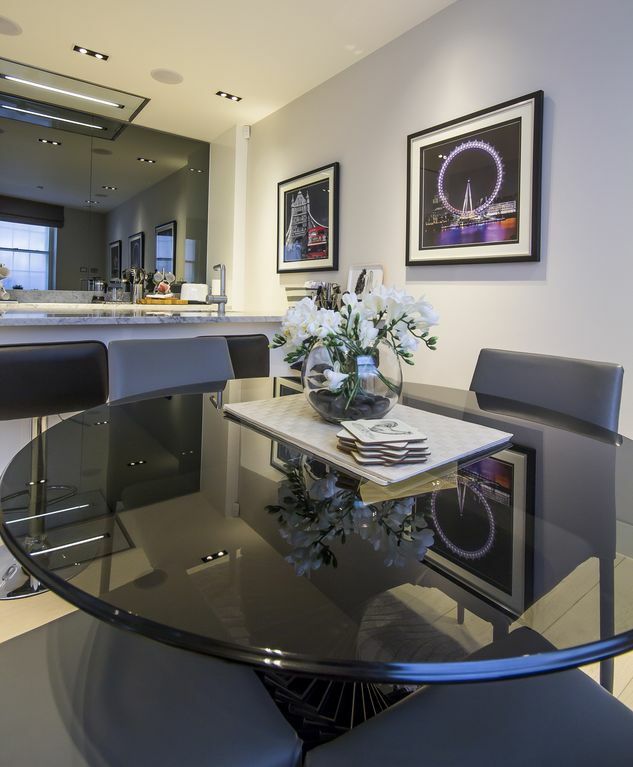 Appliances include a washer/ dryer, dishwasher and floor to ceiling fridge freezer. For cooking there are both an oven and built in microwave/ combi oven ensuring that you have sufficient space to cater for your whole party. 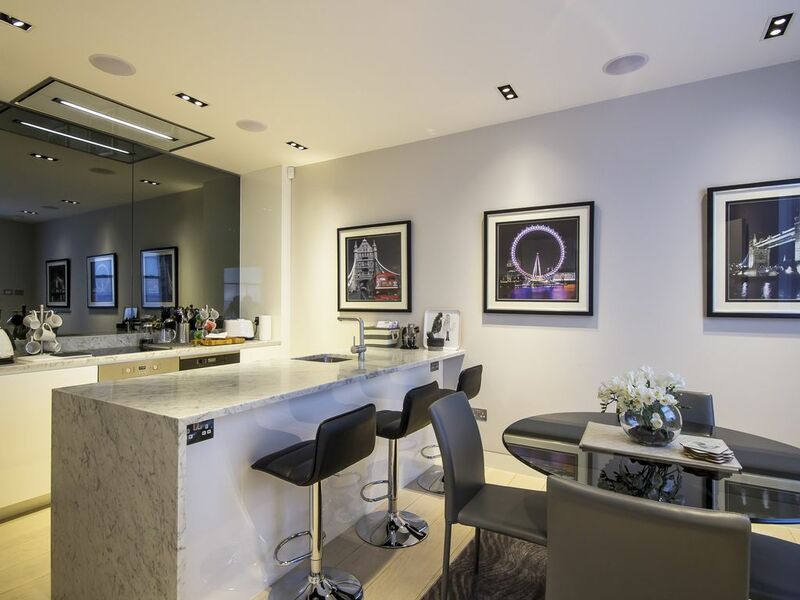 The kitchen is completed by both a breakfast bar and an informal dining area. It’s the perfect place to read the Sunday papers or look over our selection of guide books with a cup of coffee from the coffee machine. 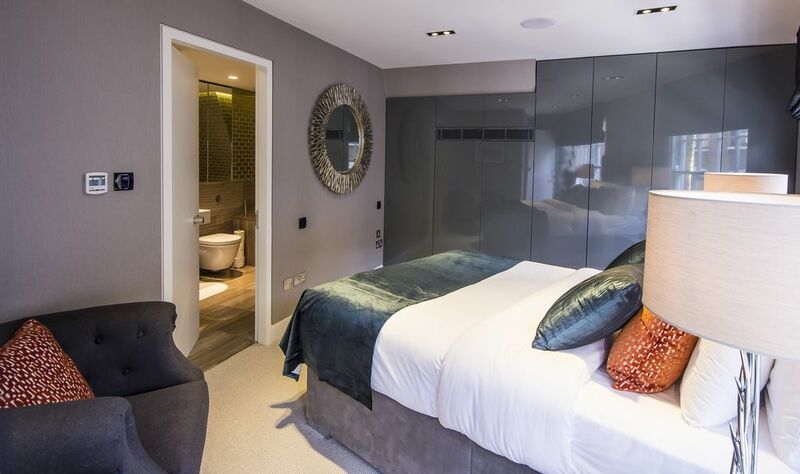 Adjacent across the hallway is the first of three en suite bedrooms. This is the smallest bedroom but it is still furnished to the highest standard. 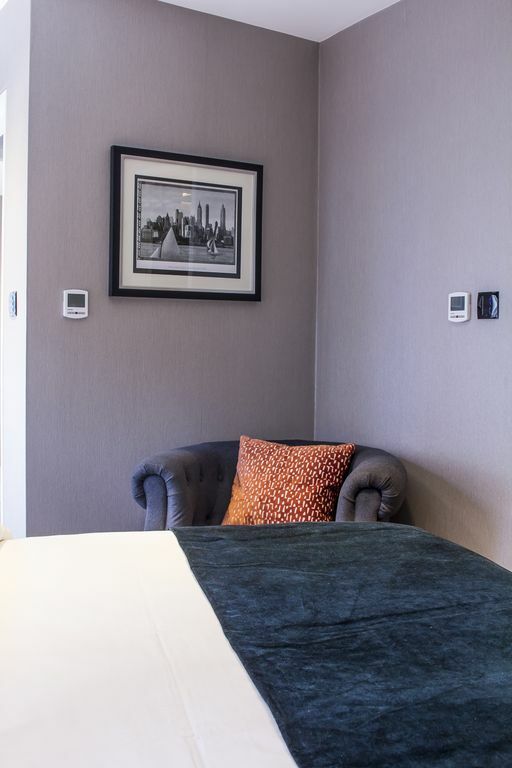 There is a double bed, plenty of wardrobe space and our ever keen attention to detail. 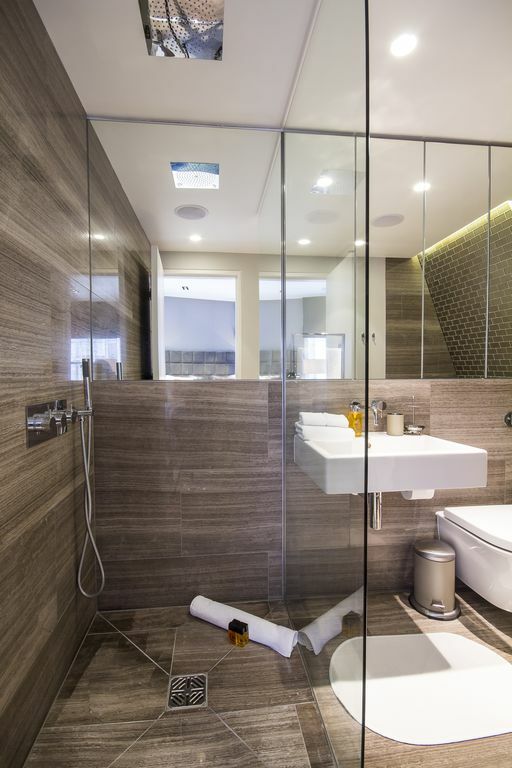 The en suite includes a shower cubicle with power shower (as do the other bathrooms) and a WC. Taking the elegant glass stairway to the third floor, you will find two additional bedrooms, including the master bedroom. 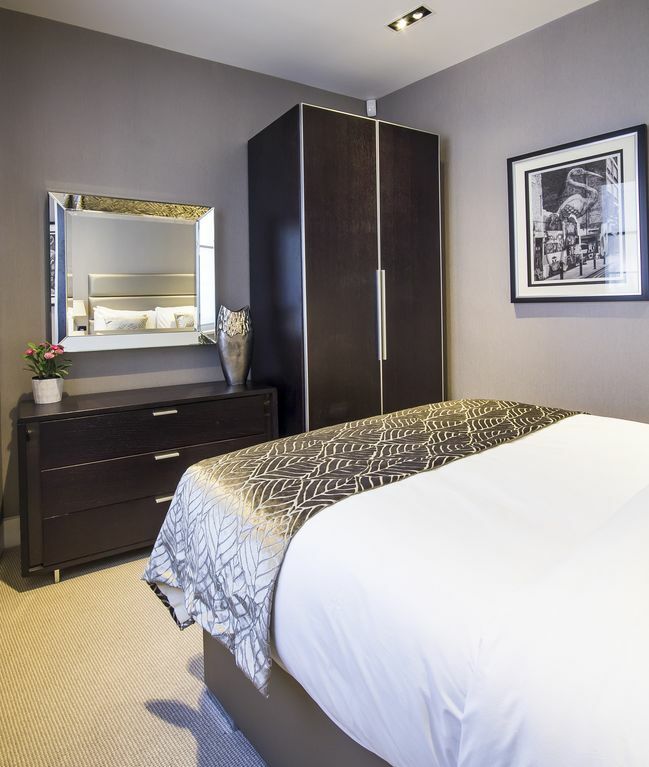 The first bedroom you come to is a twin room (sleeping two) which can be set up with two single beds or by zipping them together we can create a third double bed. 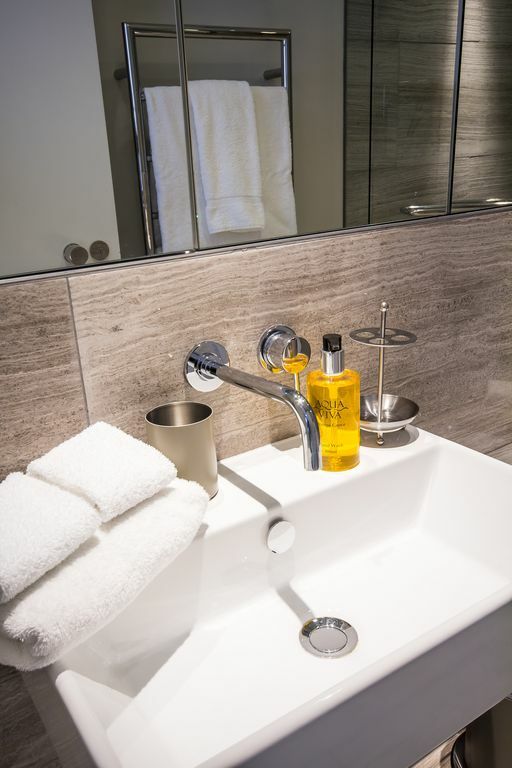 The room is again decorated to a high standard, as can be seen in the pictures and includes a large en suite bathroom with shower and WC. 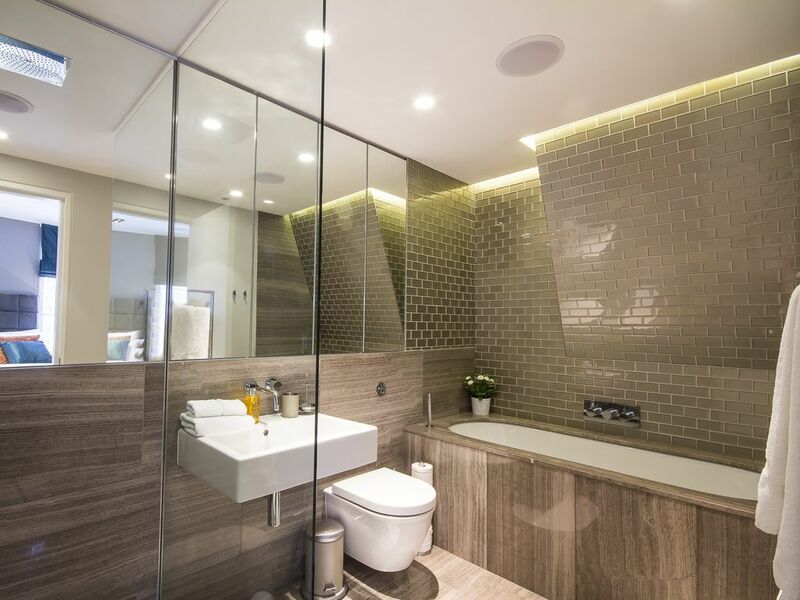 The bathroom is decorated with an exposed brickwork effect. 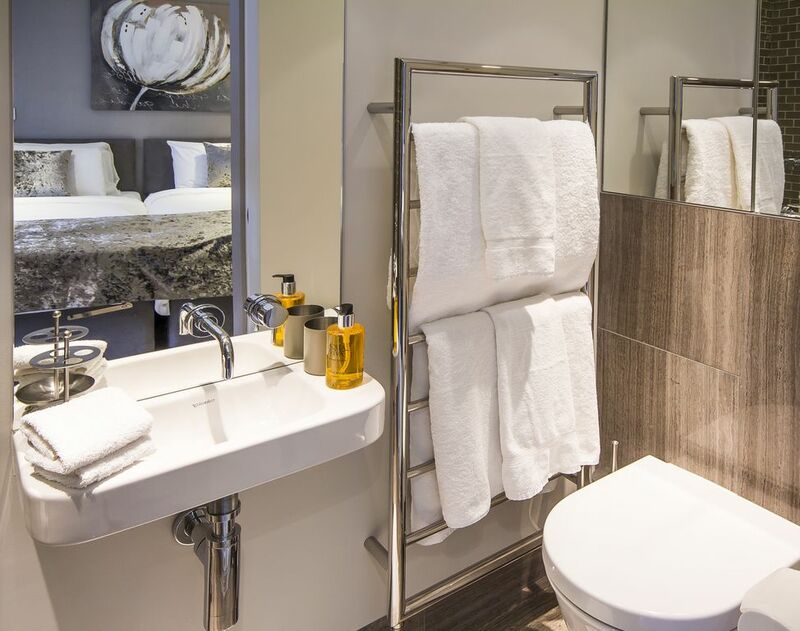 All three bathrooms are fitted with an elegant marble and stainless steel finish. 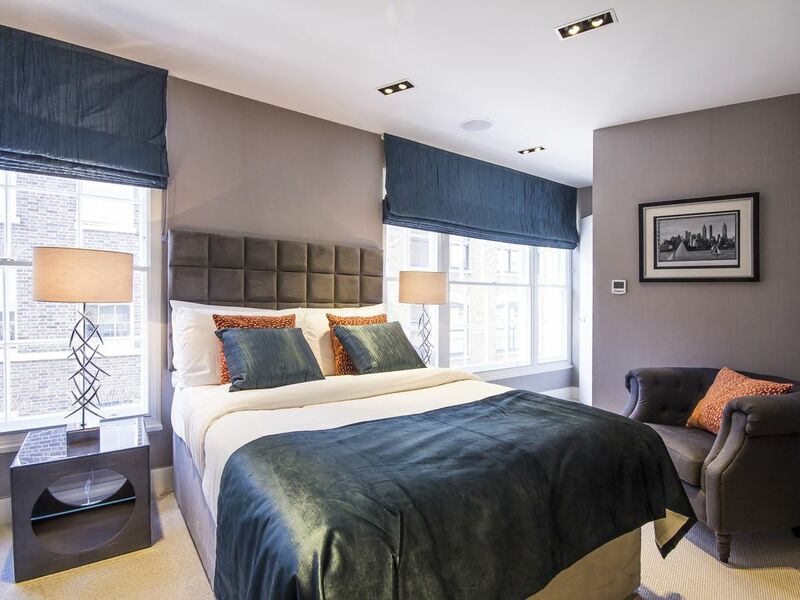 The master bedroom is the largest of the three with a king size bed (sleeping another two guests), beautiful illuminated wardrobe and chair to relax in. 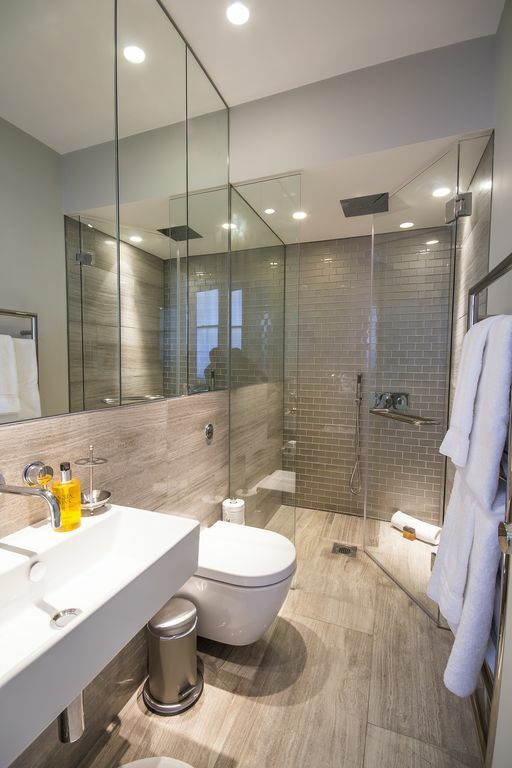 The en suite bathroom is quite large with a separate shower and bath. 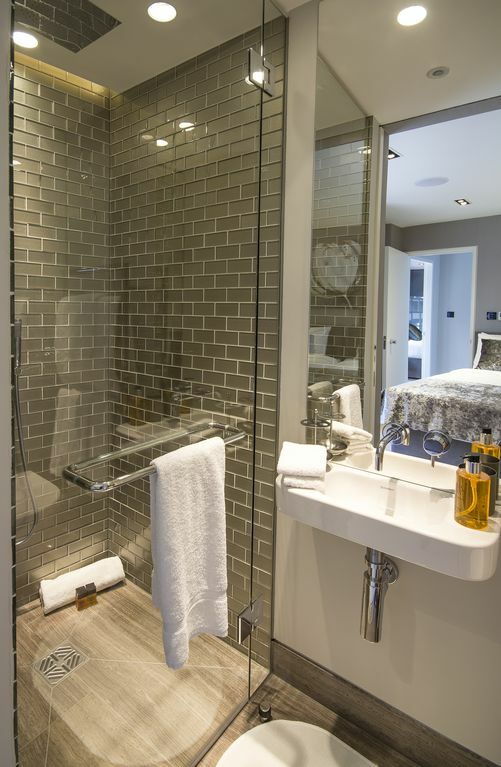 Overall, the bedrooms and bathrooms have a classic and elegant feel to them. 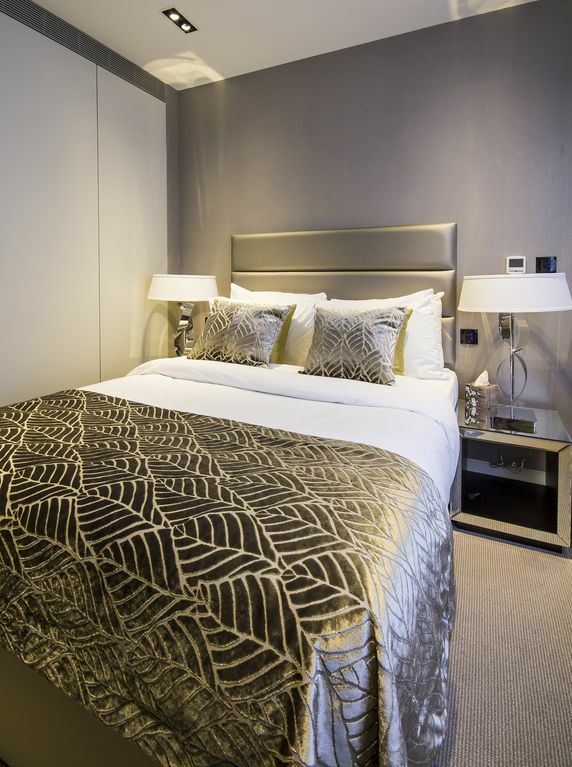 All three bedrooms are fitted to the highest standards and feature fabulously comfy bedding such as Egyptian cotton sheets and fluffy towels. 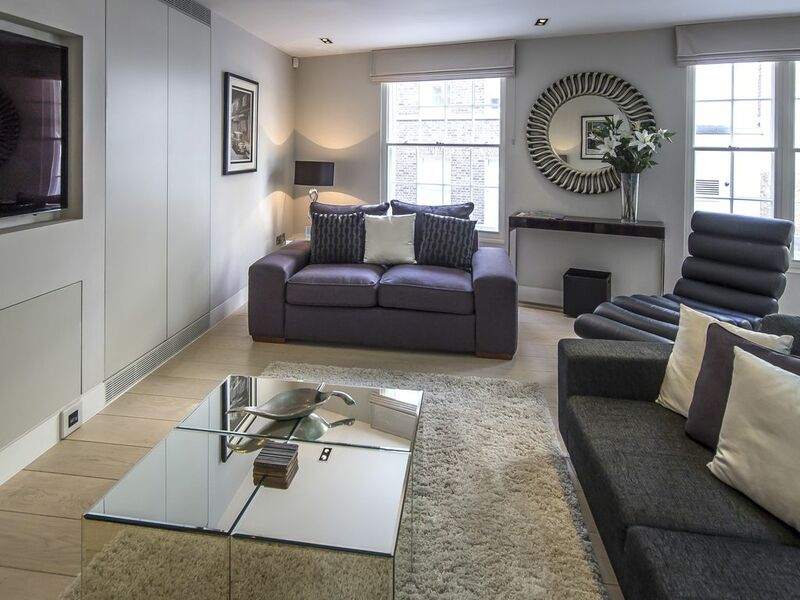 This family friendly London holiday rental is located on John Street (accessed from Roger Street) in the heart of cultural Bloomsbury. 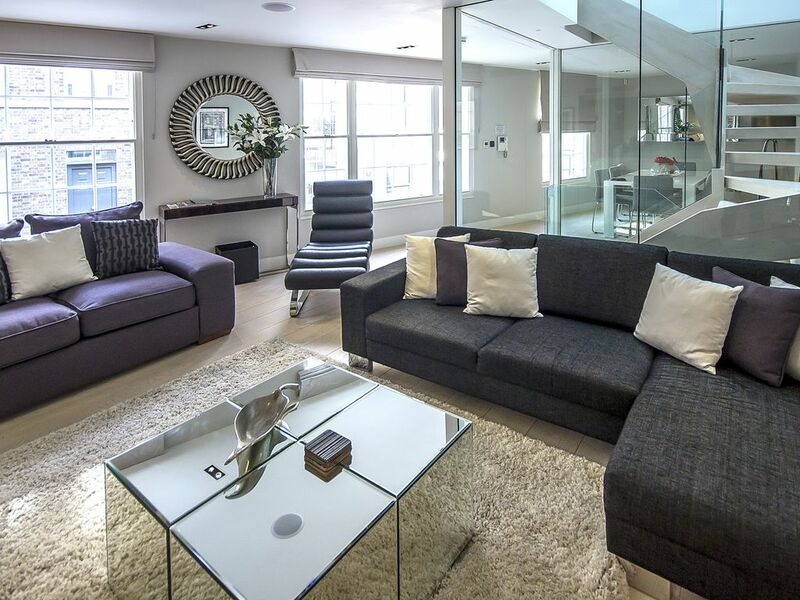 The holiday rental is equidistant from the City of London, West End and St Pancras International Station (home of the Eurostar to Paris and Europe). All are reachable in around 20 minutes or less via public transport. 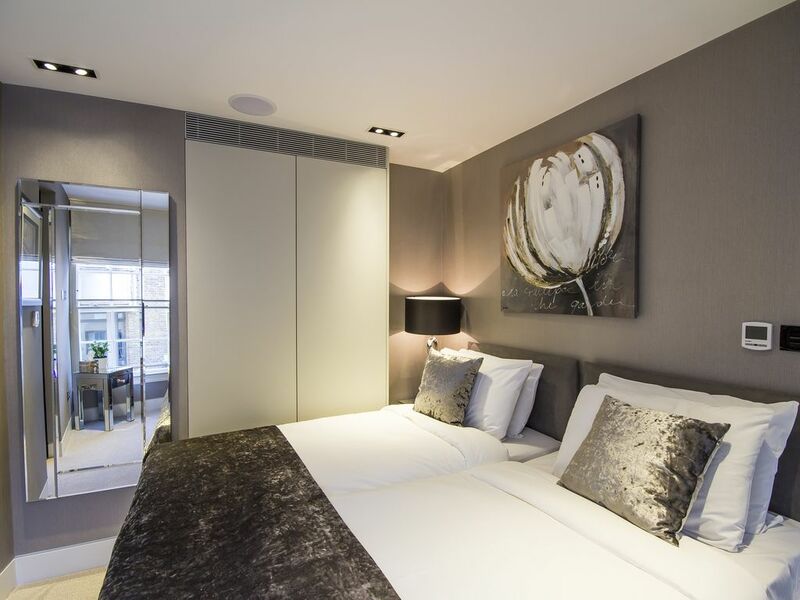 Tube stations close by include Russell Square - which is on the Piccadilly line with direct access to Heathrow in under 50 minutes and one stop from St Pancras International, Holborn and Chancery Lane. The latter two stations are on the Central Line running through London and giving direct access to the City of London.